Global mined silver supply peaked in 2015, while industrial demand reversed course and started increasing in 2016. There are still some significant shorter term headwinds, such as thrifting of silver use in various industrial applications, but that only makes silver use more viable for the longer term. Given silver's unique efficiency in electronic and electrical applications, it is fast becoming an essential commodity within the context of the increasingly high-tech global economy. The Silver Institute is forecasting an increase in silver prices of 7% this year. It is a relatively modest pace of increase, which would only lead to prices recovering to 2/3 of the inflation-adjusted price of just under $55/ounce registered in 2011, if the pace of the price increase were to be kept steady for a decade. I for one don't believe that it will be the case, at least not when it comes to the longer-term trajectory. The 7% increase in price that is forecast to occur, if it will materialize, will be the beginning of a sustained silver price boom, which might last decades. The supply/demand dynamics make it imperative for this to happen, which is why I have been steadily buying physical silver in the past few years. Industrial demand for silver set to see steady gains. A number of setbacks occurred in regards to industrial demand for silver in the last two decades or so, which created the impression of perpetual stagnation or at times even worse. Two major setbacks in particular served to dash the hopes of many silver bulls. The first was the decline in photography use of silver, and the second which came into play just as it seemed that a recovery was taking hold, namely the trend of silver thrifting in the exponentially-growing field of solar power generation. 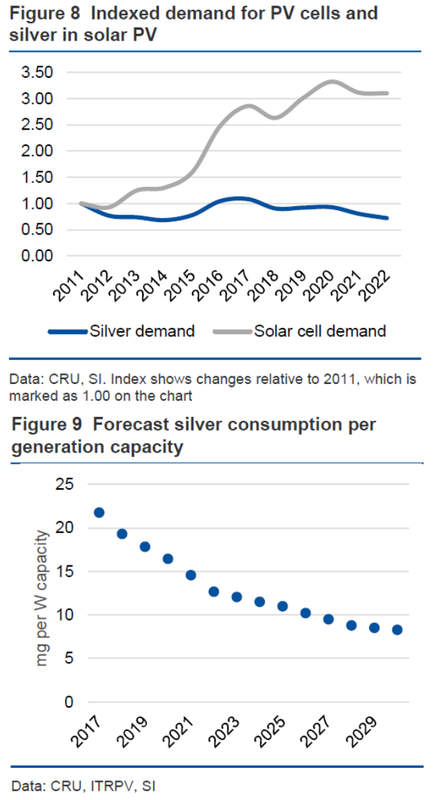 Silver demand per solar panel unit declined precipitously this decade and it is forecast to continue to decline. I am not sure whether the above-illustrated forecast can be considered to be a viable guide to the future or not. In truth, no one can know for sure, with the degree of likely accuracy diminishing the further out in time the forecast reaches. It does seem however that solar panel use of silver will be greatly hampered by the drive to cut costs. I don't necessarily believe that silver will be replaced, which is what the above forecast implies, but it will likely be further cut through further thrifting. I personally think we will eventually see a slowdown in thifting per panel and a resulting increase in silver demand from the solar power industry. The aspect of the current trend of industrial demand growth for silver, which leads me believe that we are on the verge of a sustained silver bull market is the fact that we are looking at very broad-based and diverse growth in silver use, in all sorts of increasingly sophisticated technologies. We are talking about applications which do not necessarily add a lot to production costs, but mostly enhance value and product performance by an out-sized proportion. 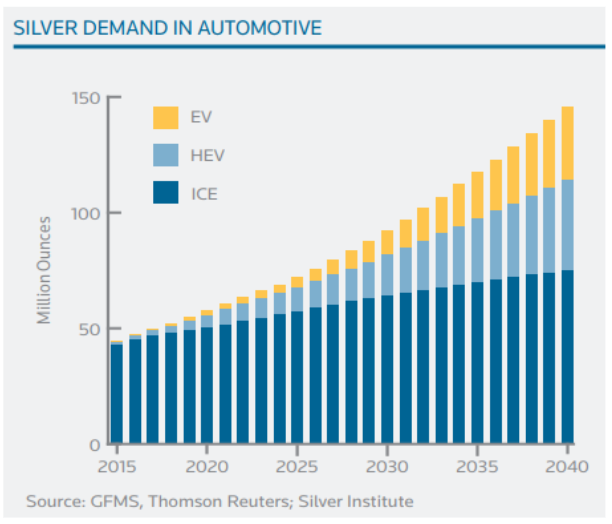 As we can see, we can expect auto industry demand for silver to almost triple for the next two decades. Unlike the solar panel issue, where the cost of silver makes up about 5% of the total cost of the final product, we are talking about an ounce of silver per vehicle, making the cost rather insignificant, even if the price of silver were to quadruple or more. As electronic equipment becomes more and more essential in the performance of vehicles, the use of silver as a part of those electronic components is essential, because we certainly do not want to use anything less than the best. In this respect, there are very few more affordable compounds which can take the place of silver as an electrical or thermal conductor. Silver is used in an endless list of electronic devices, while the expansion in demand for such devices keeps picking up world-wide. Silver use in welding is not going anywhere anytime soon, while in water purification, medicine and other applications it is expanding. There is very little doubt of its future role as an industrial material with expanded specialized, high-value use. While it is true that technological change could produce surprises at any point along the way, I also think it is less likely to happen in fields where silver content plays a very minor part in the overall cost of a product. As for other industries such as in solar, the thrifting process which occurred in the past year, can be seen as a negative trend for the short term, but also as a positive long term trend. The many-fold decline in the amount of silver that gets used in each solar panel, currently standing at about 20 grams per solar panel, makes the actual cost of the silver content less than 5% of the overall cost of an average single panel. I think, with further declines in silver use per panel, even if the price of silver were to rise, it would still make the overall cost of silver use in panels viable. Mined silver supply at current price, not likely to meet demand. As we can see from the table, industrial fabrication demand for silver was mostly on a downtrend until 2016, while until 2015 mined silver supply was rising. Now we seem to be entering an era of rising industrial demand, while mined supply seems to be on an overall downward trend, even though the USGS reported that there has been an increase of less than 1% in mined silver supply in 2018. Even with this slight production gain, we are still down almost 5% in terms of mined production compared with the 2015 high. Clearly, aspects of the current market are causing companies to hold back in terms of investment and the only way that we are likely to see a change is if silver prices will go higher. In the absence of higher prices, pure silver miners which account for about a third of global supply are unlikely to invest in expanding supply capacity. Two thirds of global mined silver supply occurs as a byproduct of other mined minerals, such as copper; therefore, supply depends to a large degree on how much expansion we are seeing in the mining of such primary products. Right now we are faced with what seems less than stellar growth prospects for most minerals associated with silver production, due to the outlook for the global economy. As it was already reported on Seeking Alpha a few months ago, copper production is only set to increase 1.6% this year. Gold mining is also in stagnation mode, while nickel production saw its highest level back in 2013, with current production off by about 12% from the peak. With silver production as a byproduct being limited, due in large part to silver prices not playing an important role in production decisions, while the global economy is currently not experiencing a particularly strong period of demand for such commodities, it is mostly up to primary silver mining operations to keep up with any rise in demand. In order to get enough of an increase from a relatively limited number of eligible mines, there would have to be a significant increase in the price of silver in my view. Silver rally could feed on itself. We are currently experiencing a period where despite a few years of demand growth for silver from industrial applications, investor demand has been weak. 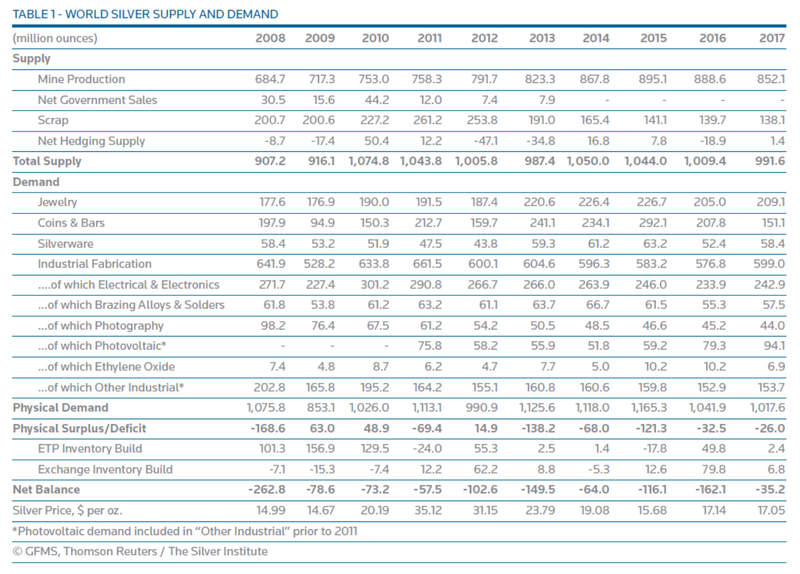 The lack of investor demand has been instrumental in keeping silver prices low in the past few years. At the same time, we should keep in mind that this same factor would help produce a rally in silver prices, which would be triggered by any whiff of the supply/demand balance tightening. Just to put it all into perspective, demand for coins and bars declined from 292 million ounces in 2015, to just 151 million ounces in 2017. That is a decline of 141 million ounces, which is about equivalent to the magnitude of decline that silver suffered in terms of demand as photography increasingly switched to digital. With mined silver production seemingly stagnated, at least given the prevailing price it has been going at in the past few years, and industrial demand increasing, silver could regain much of the scarcity appeal it had back when the price reached a recent peak in 2011. There currently seems to be no indication that investor sentiment has improved in this regard, but when it will, I think there is a very good chance that it will be rather sudden, and perhaps unexpected, with the market changing course on a dime. Given the tightening supply/demand dynamics, especially when looking at only mined supply, versus industrial demand, it may now be just a matter of an event helping to change the narrative, such as perhaps silver simply starting to follow gold higher, as it usually does. Or perhaps it could be the result of a major mine closure, drawing investor attention to the supply/demand situation. In early 2017, I wrote an article entitled "Not Enough Silver To Power The World Even If Solar Power Efficiency Were To Quadruple". As the title suggests, it was an estimate of how much silver would be needed in order to provide the world with exclusively solar energy to power all of our energy needs. I did factor in a quadrupling of silver efficiency per unit of energy produced from solar. My inevitable conclusion was that we would not have enough silver to build a hypothetical world that would run exclusively on solar power. It was mostly meant to be a visualization of silver's scarcity value, which is being increasingly greatly enhanced by the fact that it is increasingly needed in industries that are increasingly essential or desired in our current economy. While I by no means believe that we will ever strive to build a world that will be exclusively powered by solar, I think that industrial demand for silver will surprise to the upside in coming years and decades. Any resulting increase in silver prices should not greatly diminish demand growth, given that efficiency gains in its use are likely to make the use of silver in a wide variety of industries more and more economical. This is especially the case in the solar panel industry, where continued thrifting is reducing the industry's exposure to silver prices, albeit to the shorter term detriment of the silver industry, as it dampens demand even as solar power demand continues to soar. I cannot be certain of the timing of when the market will eventually take these factors into consideration, but I do think that for those who are willing to invest and wait patiently, the moment of reward is getting to be closer and closer. Additional disclosure: I own physical silver.